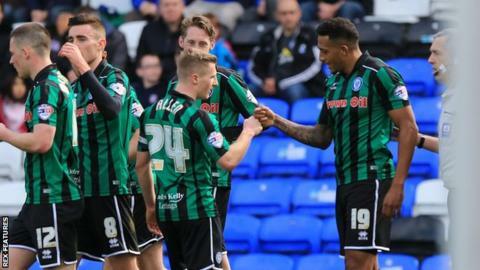 Peterborough were narrowly beaten by Rochdale as all three goals came in the first half at the ABAX Stadium. Rochdale's Joe Bunney broke the deadlock, netting from six yards before Nathaniel Mendez-Laing doubled the lead against his old club from close range. Michael Smith then halved Posh's deficit from 25 yards 10 minutes before half time. Rochdale's Bunney and Posh's Chris Forrester both saw second-half efforts well saved as the Dale held on. The result ends Peterborough's play-off hopes, with Posh sitting 14 points outside the top six, while Rochdale keep their slim play-off hopes alive, with seven points separating them and the top six. "We're still chasing the dream, it's a massive dream but the players have stood up to the challenge. "The recent form is absolutely superb and I'm really pleased with today's performance. "Our attitude, our grit, our determination in the second half to keep the second half clean sheet was magnificent." Match ends, Peterborough United 1, Rochdale 2. Second Half ends, Peterborough United 1, Rochdale 2. Substitution, Rochdale. David Syers replaces Joe Bunney. Corner, Peterborough United. Conceded by Joseph Rafferty. Substitution, Peterborough United. Shaquile Coulthirst replaces Andrew Fox. Grant Holt (Rochdale) wins a free kick in the defensive half. Corner, Peterborough United. Conceded by Jimmy McNulty. Substitution, Rochdale. Grant Holt replaces Donal McDermott. Substitution, Rochdale. Peter Vincenti replaces Nathaniel Mendez-Laing. Corner, Peterborough United. Conceded by Joe Bunney. Corner, Peterborough United. Conceded by Ashley Eastham. Andrew Fox (Peterborough United) wins a free kick in the attacking half. Attempt saved. Joe Bunney (Rochdale) header from the centre of the box is saved in the bottom right corner. Attempt blocked. Marcus Maddison (Peterborough United) right footed shot from the centre of the box is blocked.